Allium cristophii, common name Persian onion or Star of Persia; is a species of onion native to Turkey, Iran, and Turkmenistan, though grown as an ornamental bulbous plant in many parts of the world. 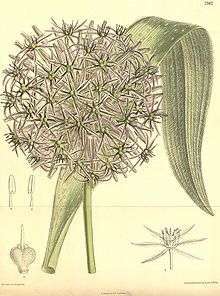 It may be sold under the synonym of Allium albopilosum. Star of Persia is a member of the onion subfamily within the amaryllis family. 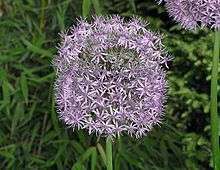 It grows to 60 cm (24") and is cultivated in gardens for its large showy (umbels) of silvery pink star-shaped flowers, 20–25 cm (8-10") in diameter, which appear in early summer. The flowers are followed by attractive fruiting clusters. The plant has received the Royal Horticultural Society's Award of Garden Merit.